One of the added benefits of teaching young children about recycling is, that they LOVE the hands-on sorting portion. And at least one of the cute youngsters will want to sit on my lap during the presentation. It is just delicious having bright eyed 3 year olds in front (and on top) of you and asking them to identify a material and then place it in the correct recycling bin. Family Services of Westchester is serving White Plains youngest students in their seven head start centers throughout White Plains. 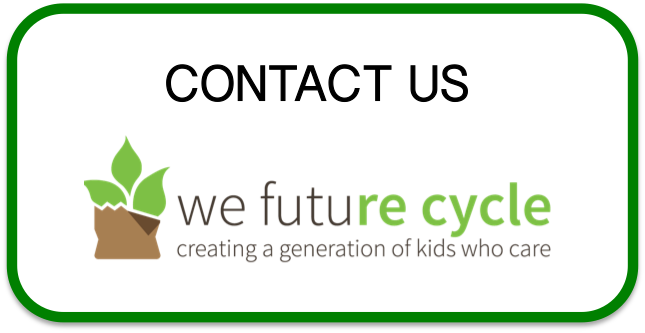 As the We Future Cycle recycling program is now running in all White Plains public schools, reducing garbage by a whopping 97% through diversion into recycling, excess liquid and composting streams, it made sense to incorporate the little ones already. Get ’em young and they will learn for life. With wonderful support by each center director and the program director, even 3 year olds will learn that their actions matter and make a difference. One father shared with me that the favorite word of his brand new kindergarten student is commingled and he sits at dinner and identifies the different materials he sees. To give some background, White Plains School district hired We Future Cycle in 2015 to implement the recycling program in its elementary schools, moving into the middle schools by 2016 and now starting the HS school. Administration at MAS has been outstanding supporters of this program and this percolates through the building. Students are lining up to help at the recycling stations, students are signing up to help sweep and wipe tables, every single classroom has a recycling stations and while walking the building it was heartwarming to see that every single bin was perfectly sorted. This proves that environmental education in schools can change communities. It teaches responsibility and personal commitment. All life long lessons. Hats off to MAS students for being the change we want to see in this world. New Rochelle High School: Changing the world…3500 students reduce garbage by 90% through sorting. New Rochelle High School is the largest HS in Westchester County New York, it is more like a college campus with sprawling hallways and mind-boggling amounts of students spilling out of classrooms when the bell rings. 3 cafeterias are on campus feeding these youngsters and until recently were generating a whopping 100 large bags of garbage e.v.e.r.y…s.i.n.g.l.e…l.u.n.c.h ! Filling up 3 dumpsters to the brim just from lunch, and another two large dumpsters from night clean. New Rochelle School District has embraced the We Future Cycle Recycling Program and steps were put into place over the summer to include the High School. Principal Richardson admitted that he was beyond skeptical about how this program could possibly work in a huge building like the High School. He however vowed his full support. In order for a recycling program to work, one has to address all players in the building. We Future Cycle did presentations to students, custodial staff, and security personal to outline just how we are all affected by garbage and how simple changes of behavior can make a HUGE difference. Putting the new knowledge to action, students started to sort their waste in the different cafeterias and learned that by simply sorting into excess liquid, commingled recycling and food waste for compost, 90% of the waste is captured and sent to reusable streams. This is the commingled recycling from 2 lunches! Only 10% of the High School waste was trash. A 90% reduction of lunch waste is huge, looking at the sheer number of players involved. Instead of filling up trash containers, the high school is now filling up commingled recycling containers and food waste bins to be composted. Way to go! Principal Richardson is exceedingly proud of his student body and is working with his Science Chair to integrate Environmental and Sustainability Education as Curriculum Add On. During the recent budget presentations the Director of Facilities for the New Rochelle School District presented cost savings of more than $100K through implementation of the We Future Cycle Recycling Program. (Click on the image or on this link to view the video). These cost savings are possible through reduction in waste generation of 97% in all elementary and middle schools. 8,000 students are now sorting their waste and thus sending food waste to be composted and packaging to be recycled rather then all of it going to trash as it had been the case before We Future Cycle got involved. It was not a road without its bumps but seeing this kind of result makes the effort well worth it. Before the WFC program, New Rochelle School District had its own garbage trucks with two dedicated Buildings and Grounds staff members doing nothing but driving from school to school to school to pick up garbage. Each school, depending on size put out 13 – 30 bags of garbage from lunch alone and the same amount again for night clean. That added up to 211 bags of garbage per day from lunch alone, without the High school and its 80 bags per lunch. Now, most schools are looking at one fluffy bag of trash weighing between 3 and 7 pounds instead of the previous 400 lbs. New Rochelle School District is now able to share services with the City of New Rochelle who has taken over the garbage and recycling pick up for the district at no cost, other than buying the special split back truck. The $100K cost savings is so far only the reduction in truck operation, garbage tipping fee, it does not include the additional savings of allocating the man power to other positions, the reduction of plastic bag purchasing and the increase of income generating recyclables to the Westchester County.